Transitioning into civilian life can present our nation’s veterans with myriad challenges. Many veterans do successfully reintegrate into civilian life. Some, however, face significant mental health problems related to their service, family stress caused by multiple deployments, and financial and employment related challenges upon return. These challenges, coupled with the stigma associated with accessing mental health and supportive services and the lack of cultural competence of many service providers, make accessing appropriate care extremely challenging. Volunteer Lawyers for Justice – Discharge Upgrades – training local attorneys to provide pro bono representation to servicemen and women who were less than honorably discharged due to mental health issues incurred as a result of their deployment. Rutgers Foundation: University Behavioral Health Center – Veterans Mom2Mom – telephone peer support and resources for people struggling with parenting issues as a result of military involvement. Rutgers Foundation: Rutgers Institute for the Study of Child Development – Project COMBAT – to educate and train teachers, mental health professionals, and family workers in Newark pre-schools and Head Start Centers to recognize, understand, and deal with the special challenges that affect the children of military families. Trinitas Health Foundation – Project PRIDE for Veterans – a cooperative arrangement with the Elizabeth VA Outpatient Clinic to provide individual and group counseling to veterans diagnosed with PTSD and other conflict-related mental health issues. 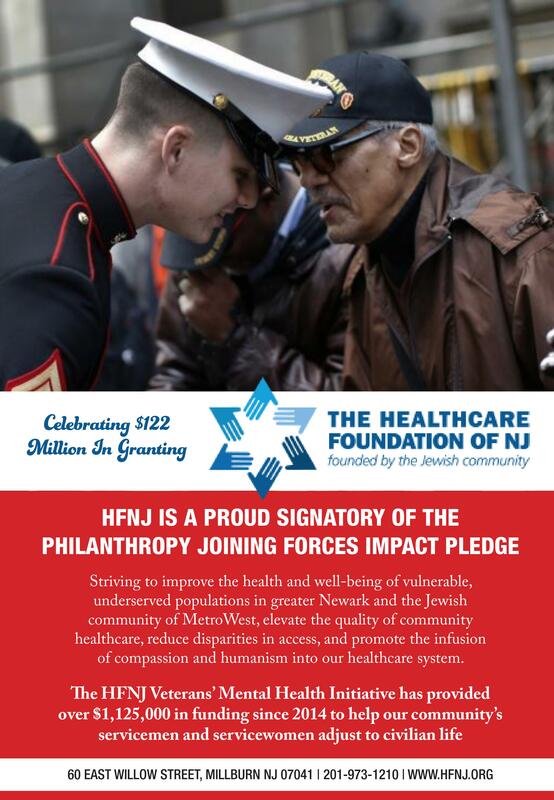 Rutgers Foundation: FOCUS Center – Vets’ Interactive Project (VIP) – to recruit and train a masters-prepared social worker with a military background to serve as a liaison to connect veterans to mental health counseling, primary care, and other resources. Main Street Counseling Center – Veterans’ Counseling Initiative – providing individual and group counseling to address the mental health needs of local veterans. Cornerstone Family Programs – Our Sisterhood of Soldiers – social, supportive, and therapeutic programs for female veterans to address PTSD, major depression, and related conditions like substance abuse, poverty, and the after-effects of sexual trauma experienced during their service. Community Hope – Veterans’ Peer-Led Support – capital funds to purchase a handicapped accessible van for dedicated use by the agency’s most disabled residents; peer counselor to provide individual and group support to residents. Corporation for Supportive Housing – Veterans Supportive Housing Academy – training for local providers who deal with veterans to increase their military cultural competence and understanding of the issues involved with working with servicemen and women.